This Small French Cookie Brand Sweet Talked Its Way Into Starbucks Stores Across the U.S.
Everybody in business dreams of getting that big break—an out-of-the-blue phone call from some corporate big shot who could make a company's future in a 10-minute meeting. 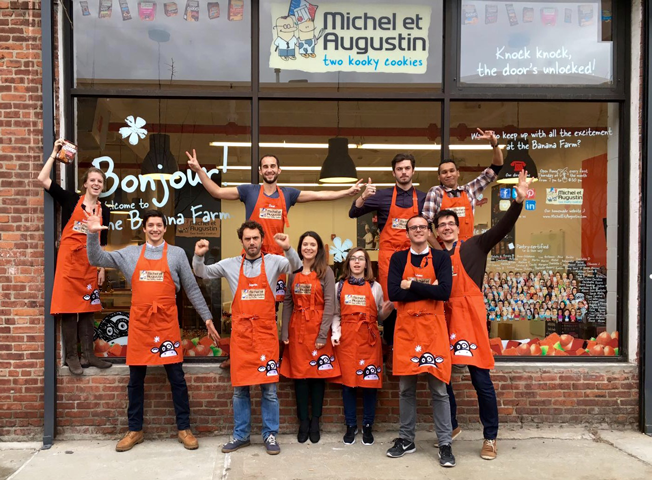 Last June, French cookie company Michel et Augustin got just such a break, including the phone call and the meeting. The call was from none other than Starbucks—the assistant to CEO Howard Schultz, to be specific. 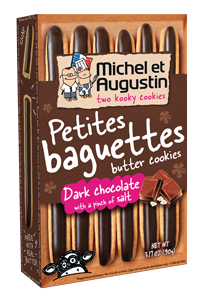 The coffee giant had a request: Could Michel et Augustin ship some cookies to Seattle, pronto? Since it was already Friday night in Paris, the cost of getting a fresh batch to Seattle by Monday morning was astronomical. That's when co-founder Augustin Paluel-Marmont decided he might as well just send an employee, who could take the cookies as a carry-on. "Who wants to go to Seattle for the weekend?" he called out to his staff. Nobody really did, but the brand's U.S. communication manager, Charlotte Cochaud, and its head of audiovisual content, Hassan Strauss, nevertheless volunteered for the 10-hour flight. Then they made a pivotal decision. If Cochaud and Strauss were going to go to the trouble of flying a big box of baked goods all the way to Seattle, they were going to bypass the assistant and put them directly into Schultz's hands (not that the CEO knew they were coming.) And to bump up the odds of getting into the big man's office, the pair decided to shoot video of their odyssey and post it in real time as a multiepisode series on YouTube, reasoning that Michel et Augustin's fan base would help them with their pitch to Schultz. It was a nervy move, but Cochaud believed that when big breaks come, you go all in. "I just decided to try," she says now. The result was unique in the annals of content marketing: a minute-by-minute documentary of how a small brand got its big break. By 2015, the company's volume hit $35 million. Michel et Augustin had baked some 150 million cookies which it distributed to 23 European countries. The only thing left was to hop the Atlantic. Renting space in a converted industrial building in the Gowanus neighborhood of Brooklyn, N.Y., advance man Antoine Chauvel spent the next year hitting the pavement, offering cookies to every coffee shop and specialty food shop that would try them. "Antoine knocked door to door and said, 'Hey guys, we're French and we're baking supersonic cookies,'" Paluel-Marmont says. The cookies are all baked by pastry chefs in France, so Michel et Augustin had a compelling sales proposition right out of the gate. But Paluel-Marmont points out that it doesn't much matter where cookies come out of the oven; it's the recipe and the ingredients that ultimately make the sale. "We're not inventing rockets here," he said. "When people taste the cookies, they buy them." One of the places Chauvel went was the Bedford Cheese Shop, a gourmet institution near Manhattan's Union Square. The store liked the cookies and put some out for sale. A few weeks later, a buyer from Starbucks dropped by and helped himself to a supersonic cookie. By the time Cochaud and Strauss volunteered to fly to Seattle, they had only hours to pack—clothes and cookies—for the next afternoon's Delta flight out of Charles de Gaulle. Before they even left for the airport, Strauss started filming. Cochaud recounted the call from Starbucks and appealed to Michel et Augustin's fans to "help me meet Howard" by taking pictures of themselves with a cup of coffee and posting them with the hashtag #AllezHowardunCafé (which roughly translates to "Hey, Howard, let's get coffee together."). "We can convince him to meet us, because we only have 48 hours," Cochaud implored in the video. "It will be complicated, but we'll get there." Allez Howard Episode 1 was ready for YouTube before Cochaud and Strauss even left Paris. They shot Episode 2 on the way to the airport and Episode 3 on the flight. The third episode featured footage of Cochaud trying to sleep in a coach seat with her box of cookies, signing off by saying, "Howard, here we come!" By the time they landed in Seattle on Saturday afternoon, 100,000 people had posted photos of themselves with cups of coffee. Cochaud printed them all and bound them in a presentation booklet, then headed for the first Starbucks location at Pike Place, where she did man on the street interviews and handed out cookies. Starbucks, meanwhile, had picked up on the pair's social media activities and advised Paluel-Marmont to tell his ambassadors to cool it with the web publicity. "Apparently, Starbucks finds our way of doing things a bit scary," Cochaud said—to Strauss' video camera as part of Allez Howard Episode 4. Cochaud was undeterred: "Quite simply, it's the meeting of our life," she said. In the end, Starbucks decided to forgive. On Monday morning, Cochaud and Strauss were led to Schultz's office, where they gave him the cookies and the booklet of fan photos. "Charlotte, I am amazed that you're in Seattle, and I'm so proud of you to come all the way from Paris to Seattle to meet me and talk about your cookies," Schultz told her. "Starbucks will take a very good look at this product." Of course, Strauss caught Schultz saying all this on video, which he promptly posted as Allez Howard Episode 5. As it turns out, Michel et Augustin's odds of landing in Starbucks were probably better than they realized when Cochaud and Strauss flew to Seattle. According to Lizzy Freier, managing editor of Technomic's Menu Analysis, "Large chains like Starbucks are going in this anti-chain direction and trying to convince consumers that even though they have a huge presence, they still care about high-quality and premium fare, local products and artisanal producers. By partnering with this small Michel et Augustin company, Starbucks is attempting to tap into this artisanal trend." Starbucks wound up doing a test run of Michel et Augustin cookies in 415 stores and in January decided to roll the cookies out nationally in all 7,624 of its locations. It's hard to say whether it was the guerrilla video effort or the personal visit that made the difference. Then again, maybe it was just the cookies, which were already generating buzz in the months since they'd come to New York. Cochaud believes the visit had a lot to do with it. "We had a tasting session, and Howard served me coffee," she recalls, adding that Schultz was impressed with "our entrepreneurial way of thinking." "I think he was touched because he remembered when he was an entrepreneur," she said. For its part, Starbucks seemed swayed most by the cookies—but the social media effort probably didn't hurt, either. "Foremost, we look for a delicious product made with quality ingredients," a spokesperson told Adweek, adding, "We always appreciate a spirited and authentic story from a passionate entrepreneur like Michel et Augustin."